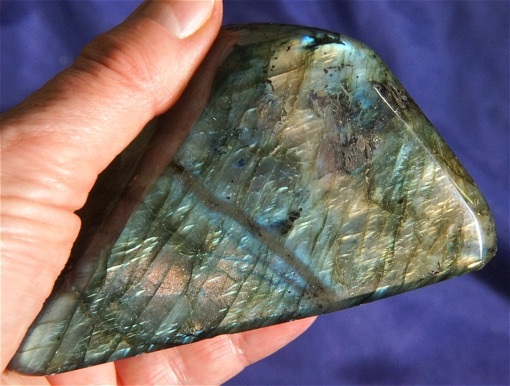 This is a spectacular and extra large piece of polished labradorite from Madagascar, 12.5 oz and 4" by 2.2" by 1.4". Every place you look, there is a flash – largely blue and yellow and shadings of orange! As you turn the piece, the colors undulate like the auroras against the midnight sky and in fact, they have been nick-named “frozen fire of the Auroras Borealis”! This piece has one area that wasn’t polished out but it isn’t troublesome in the least. No one who has ever seen the aurora will ever forget; it stirs a sense of longing and belonging similar to the call of the geese in the fall. Labradorite is wonderful for Third Eye application, enhancing intuition and psychic abilities. She opens the Third Eye wide, allowing her Keeper to see things in different dimension. I am mesmerized by her effect and the wonderful sense of well-being she instills. She is perfect for a crystal healing or Reiki practice and would be awesome for personal use by the Healer as well so that the Healer may better perceive the true nature of illness.